When I went to Lincoln’s house last Friday, there was something odd about the inside tour. There weren’t tour guides, first of all, but rather personnel stationed throughout the house to make sure you didn’t touch anything and to try to answer random questions to the best of their abilities. The second weird thing is that the little signs in each room had a cell phone number you could call for an audio tour. I thought that was kind of “retro.” Why not have a QR code or even something more creative, like a special account you could tweet for information? After my trip, I looked up different historical sites on Twitter. I found quite a few, but most of them had very few followers, and most of the tweets were nothing more than announcements about upcoming events. In other words, promotion after promotion. I then thought about it a little more, and I came upon a realization. This is all well and good if you are an entrepreneur who is trying to make a living primarily based on these new opportunities Social Media offers. But there is a gigantic problem. A lot of people have jobs with companies that already exist. Some people work for companies that have existed for decades or maybe even a century. Our own little agency has existed for 57 years. If you’re already working for a company or if you own a company that has existed for awhile, you don’t really need a blog that makes you all of your money. Since that is what most people in Social Media seem geared toward right now, what point is there for existing companies to use Social Media? Right now, the structure of Social Media is like a pyramid. At the very pointy top, you have the mega-bloggers who make a pretty nice chunk of change off their blog site. Then you have the people just under them in scale, and so on and so forth right down to the base, the largest segment of people, who are wondering when the goodness will trickle down. The problem with this pyramid structure is the same problem that holds true in pyramid schemes. The people at the tippy top are the pioneers. They set up the formula I mentioned above, and they have lived it. 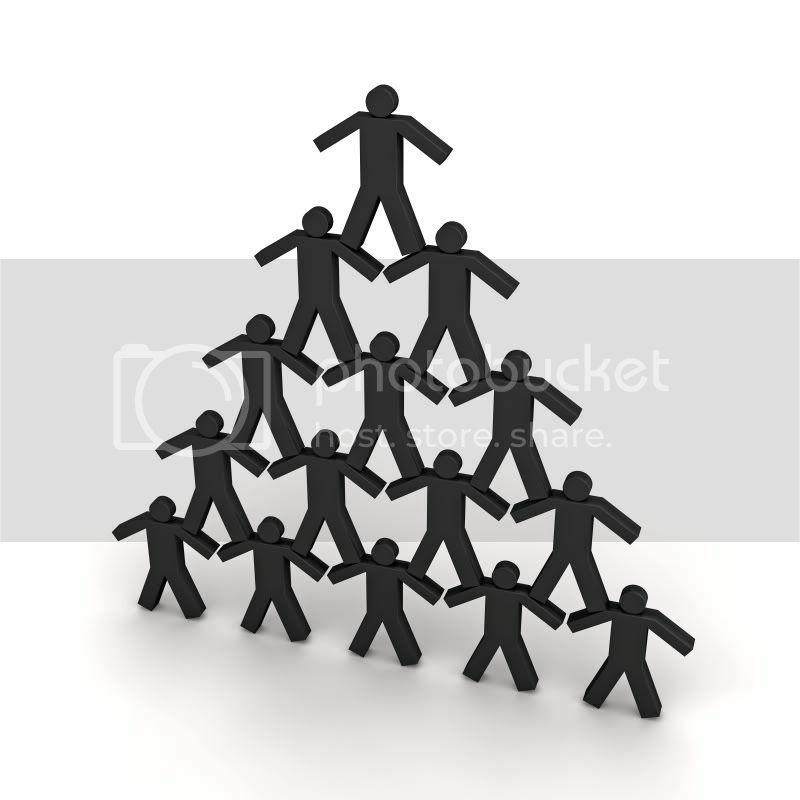 The people in the next segment of the pyramid are depending upon those people at the tippy top to lift them up. 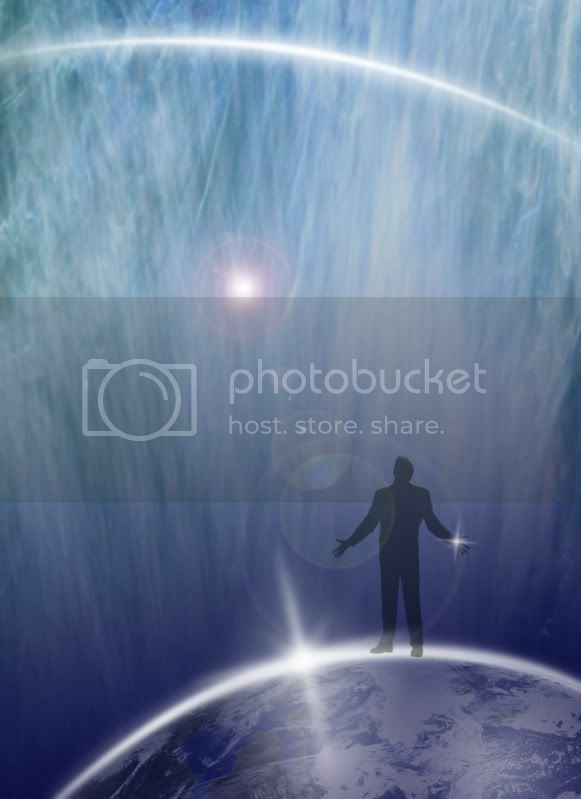 The people the next level down are hoping the 2 levels above them will help pull them up. But there’s only room for so many at the very tippy top. There’s only so many similar messages people will be interested in. There’s only so much money people will pay through affiliate links or clickable ads. If you aren’t there right now, one of two things will happen. Either you’ll have to find another means of success or you will start chipping away at the stream of revenue the people at the tippy top have been depending on. In both scenarios, the current state of Social Media as an entity is not sustainable. Well, in Social Media, we’re starting to have the same problem. Because everyone is after that single formula of success (big blog, big book, big booking), the messages are very similar. “That kind of post got that person a lot of traffic. I will write something similar.” It’s going to get a bit crazy and super boring if we keep on that track. Rather than focusing on how to grow your blog, the focus needs to shift. How can you grow your existing company using this new tool? Yes, you’ve had success doing what you have always done. You’ve survived the dot com boom and bust, the rise and fall of print, radio, television, and Friendster. But this Social Media stuff can enhance the experience your customers have with your company! Where is that message? Where is the advice for companies that don’t want to grow a big blog site but rather want to reach their existing and potential customers in new and fun ways? If Social Media does not reach out to those folks, it is Social Media, not those companies, that will implode. Because right now, Social Media is eating itself up. It’s shifting traffic from one place to another, where the words and tone are different but the message is the same. It’s time for Social Media to mature by acknowledging that the fun part of the revolution is over. Yes, you can talk to customers and prospects one-on-one. Who cares? What does that mean for companies who have been around before computers even existed? What’s the next step after you learn how to use these platforms? In my experience in technology, there have always been the “haves and have-nots”. In the early web, one side didn’t have a web site, the other did. Then the have-nots got websites, inevitably built by an 11th grader with Front Page – and the “haves” got better sites. And so on. Now, there are companies that engage with their customers – using social media – and companies that just don’t get it. They will eventually join the companies that are- who by that time, will be on to better deeper engagement. I know what you mean, Ric. I guess my concern is that the “have-nots” in this case may not see much reason to become a “have.” If they aren’t interested in some of the key goals you hear about in the world of Social Media, what is their incentive to change? Those brick and mortar companies who haven’t felt the need to engage their customers through social media will eventually end up doing so. As Ric points out, they’ll do so but the companies who already do engage will be on to better, deeper engagement. There is a bit of a generational divide, with plenty of baby boomers lacking an understanding of social media, or worse, exhibiting disdain for it. The good news is that there are always people willing to be the ‘innovators’ for their business/market. I do think it’s a social media pyramid, but I’m not sure that it isn’t capable of expanding to maintain the greater number of participants. Sort of the pyramid equivalent of ‘making the pie bigger’ to ensure more people get a slice. But you’re absolutely correct that there is a LOT of the ‘lather, rinse, repeat’ action, with so many going after the same success formula. That’s where differentiation through content quality and niche will truly matter. You could be right, and I hope you are, regarding there being more room at the top. But will that space open up just as the big names diminish? Are there enough people interested in the same kinds of stuff to allow for more big blogs and big players? I’m just not sure. It will be interesting to see what happens over the next year or so! You’re point’s well taken. There’s an awful lot of social media “echo chamber” effect (like there is with news on cable TV). But there are many, many organizations using social media to advance themselves and their customers (as we all sermonize about). The IT and biotech industries are rife with examples of such organizations. Most of us just don’t follow the conversations, because we’re not members of those industries. I am sure you’re right – that’s part of my point though. Why isn’t that topic interesting to the Social Media world at large? You’d think that creative ways to use Twitter would be the stuff getting the most reactions on blog sites. Instead, stuff about blogs gets the most reaction on blog sites. Kind of silly, non? You asked so here are my thoughts: Social media is a new form of marketing and contained within marketing is advertising. We have to wrap our arms around that. We see companies jumping in and are going by they are reading on how to do it. No one knows concretely how to use social media to be 100% effective. It is still not 100% known how TV is able to be used as it keeps changing; ie with being able to watch on the internet with limited commercials. Each industry will use social media differently for it to be effective. What will work for Joe with his restaurants is not going to work for Margie with Clayman’s. We have clumped industries together and watch what everyone is doing before we take action. If X says it, people rush on over. We saw it with Quora and now Empire Avenue. People go in drones because if big name says it works and then another big name says so to, then it has to. I guess in a way I am more that one that wants to not follow the leader or in different terms a laggard as why jump on something that is a time sucker. I would rather chat with you on the phone for 2 hrs as there is more value there than in buying shares on Empire Avenue. This is not to say that you are a time sucker. You are a time gainer if you must know. Social media is starting to adjust itself in a way. We are seeing where education is coming to the forefront as blogging over and over saying the same thing as everyone else but differently; of course with authority, authenticity and transparency (rolls eyes) is filling the ego and not the wallet. Now being paid to write, is different. We are all learning this space and how effectively to use it. What works for me may not work for you. Social media has become the generalist of marketing and does not pinpoint the industries and how each would use it. Sure there are agencies that “cater” to a certain industry but if we play detective, we will see that they are doing the exact same thing as the guy next door who is with an other industry. Generalist. Let’s delve into that in our next chat-a-thon. Oh, you gave me goosepimples! Yes yes yes! I believe that we are all painting with a brush that is too broad in more ways than one. Something that works for an advertising agency will not work for a manufacturer of hand soap when you get down to the strategy of it. And maybe that’s also missing too – the factor of creating a strategy, a veritable military campaign, and then sticking to it no matter what. Boy, that’s a humdinger I’m going to have to think about. Thanks! #1 – Social media doesn’t drive popularity – it reflects popularity. The reason no one follows the people at the “bottom of the pyramid” is because they haven’t gone out into the world and created a brand for themselves outside social media. Look at the top 100 Twitter accounts – every one is famous in the real world. #2 – I’m not sure what is wrong with the Lincoln house approach, it seems well reasoned to me. If the cell phone tour works, why make it “fancier” with a QR code? Almost everyone has a cell phone. Many people have no idea what a QR code is. Both points go to the same thing: many people expect social media to drive action, but it generally doesn’t. In my experience, Twitter and Facebook are almost always just reflections of what is happening in life – through whatever medium – rather than drivers of action. P.S. Disclaimer: Current opinion only. I’ve been wrong before and I’ll be wrong again! I’m not 100% sure the people at the top of the Social Media pyramid are famous in “real life.” If you mention a Chris Brogan or a “copyblogger” to someone not enmeshed in the industry, they don’t really know who those people are. Your point about the Lincoln house is well made. I was trying to get at the fact that historical places like that have a HUGE opportunity to do really neat things in terms of outreach using Social Media, but we don’t seem to be there yet, and that is a concern, at least for me. Margie, you bring up a lot of interesting points, and so does salah@soaphope in his comments. *waving at salah@soaphope though we’ve never met* I think that with a good strategy, social media can drive popularity. It gets your name/brand out there and it definitely expands your circle of valuable contacts if you put in some time and effort to be helpful, thoughtful and share great content. I can see both sides of the Lincoln house anecdote. Yes, almost everyone has a cell phone, and that method may work now, but it’s not very engaging. I agree with salah@soaphope’s comment about QR codes – at this point, many people don’t know what QR codes are or how to use them. I think the special account you can tweet for more information is a great idea. Or what if people had an incentive to check in at that site through foursquare? The social media pyramid is a good example of why we need to avoid a case of the “me toos” because that won’t get us very far. Would it be nice to be the next Chris Brogan or Scott Stratten? You betcha. But that’s not very realistic. And that’s not why I’m in social media. Finding your own niche and building an audience that way can be profitable and it can drive action. salah@soaphope, I respectfully disagree that Twitter is almost always a reflection of what is happening in life. I’ve seen and experienced that Twitter can drive business relationships, give people quick access to information that would take a long time to find on their own, etc. I agree that Facebook often simply reflects what’s happening in life, but I think that’s more on people’s personal accounts. I’ve seen some businesses and nonprofits use their Facebook pages very well for engagement and discussion with potential customers/donors. As another commenter suggested above, I think that we can make the Social Media pie bigger. We are not all going after the same audiences, and we need to find creative ways to encourage our own niche audiences to engage with us. My social media strategy is aiming for quality, not quantity, and so far, things are going pretty well. This is not to say that it’s all one way or all another. However, from where I am sitting in the Social Media orbit, it seems like predominantly, the focus is on the formula I mentioned above, and it’s creating a desire in people to “be the next.” As you say, I’m not really sure what those folks will end up with if they maintain that goal. Hopefully not feelings of failure or misery. The reality is that because we are breaking into a world where the top of the pyramid already exists, we’re automatically in a different place than the people who started on Twitter 4-5 years ago. Sad but true. I love this post Margie, precisely because I am tangled in these same dilemmas. I’m working out how these tools can help to build and sustain businesses that have traditionally been built through networks, referrals and strong personal relationships. I want to use social media as a medium to reach a different group of people and provide a steady stream of interest in the knowledge my clients can share, not spend my time talking, writing or tweeting ‘about’ social media or attracting a vanity following. The business model you describe (blog, book, bus-tour) is interesting to observe from a distance, but is not the only model of interest. I think Social Media may have been in the hands of the developers and marketers for too long. Now we need to let the real users get at it and find more pragmatic ways to use the tool to grow their business. Great topic and conversation starter, Margie. You’re so right – such an incestuous relationship can’t sustain the numbers that are trying to jump on the bandwagon. I like to use social media as a research station – keep up-to-date on trends, thoughts, opinions, etc, then use that to help my company and clients succeed. Shell game, club or clique per Danny’s incestuous. Your Pyramid scheme and shuffling from one to another without every trying or creating anything new, think that’s a big problem I’ve seen in SM, as is that career path you’ve outlined. Already seeing that after my first 10 minutes on G+. Why? As Suzanne said, people jump on what worked here, apply it there without considering if it’s the right fit for that business or industry. It’s the lather, rinse, repeat using the same shampoos, not recognizing that there may be a need for a different one. Hmm… very interesting thoughts, will have to think on this some more. FWIW.